We place high importance on the eye and vision health of your children. One-in-four children suffer from vision problems that interfere with learning. Vision problems can disenfranchise children socially, athletically, and academically. You can help your child avoid these problems by ensuring they receive high-quality eye care at a young age and throughout their childhood. Babies must learn to see. You, as a parent, can do a lot to ensure your child’s vision develops properly. Babies begin learning to see by following moving objects with his or her eyes. If their vision is developing properly, they should start to reach for objects and eventually, as their hand-eye coordination and depth perception improves, become more adept at doing so. To help them with this development, use a nightlight in their room and move the position of the crib around the room regularly, placing your child at different locations in the crib. Ensure you place the mobile or other toys about 8-12 inches away from the child’s face, within their range of focus at this age. Alternate left and right when feeding your baby too. At this age, both eyes should begin to focus equally as well. Eye movement and eye-body coordination will continue to improve. Give your baby freedom to explore his or her surroundings. You should let children this age explore the shape and texture of things. 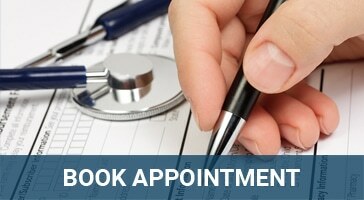 At around six months, schedule an appointment with us for his or her first eye exam. This will enable us to identify and treat early any vision problems. 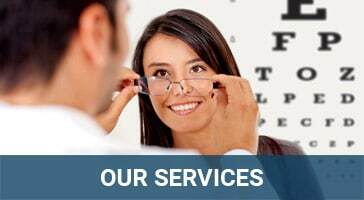 We will test for signs of excessive near or farsightedness and astigmatism, and any problems with eye movement. After this first exam, if no problems are detected, your baby should have the next exam at around age three, then again around age five before beginning kindergarten. At this stage of development, your child will start to focus with both eyes working together, allowing better judgment of distances. Let the child crawl and ultimately walk at their own pace. Crawling is important for the eye-body coordination. Provide your child with more challenging toys like stacking blocks or things they can take apart and hold / touch / see at the same time. Children at this age continue to develop eye-hand coordination and depth perception. Playing catch, building blocks, and doing puzzles with help this process along. Avoids coloring, doing puzzles, or other activities requiring fine vision motor skills. This is the age of your child’s second vision checkup. If necessary, your child can be fitted with glasses or provided vision therapy to correct any vision problems identified. Use age-appropriate terms to describe what will happen to the exam, such as comparing the vision chart to identifying letters in the alphabet. Explain that they doctor might shine a light in their eyes, like a flashlight. Assuming no problems are detected during the examination, by comparing the results of the next eye exam at age five, the optometrist can assess whether your child’s vision development is on-par with children entering elementary school. Does not perform to his or her potential. Plan on, in the absence of problems requiring more frequent visits, bringing your child in for an eye exam at least once every two years. School vision screenings are not a substitute for a professional eye examination conducted by an optometrist. We can prescribe contacts, glasses or therapy as needed depending on the condition diagnosed. There are three keys to a good education for your child: good schools, good teachers, and good vision. In school, your child uses his or her eyes constantly. In the classroom or on the playground, your child’s vision will have an impact on how well they do. For school, a child must be comfortable seeing and focusing on things 10-13 inches away when they read, draw, or do other tasks at the desk. Their distance vision should enable them to see the teacher and the blackboard clearly. A child needs good binocular vision (the ability to use both eyes together), and move their eyes smoothly and with clarity across a page or from object to object. Focusing skills, excellent peripheral vision, and eye-hand coordination helps learning too. If any of these vision skills are impaired, this can cause headaches, fatigue, eyestrain and make your child work much harder. Children usually start to participate in sports at a young age. Don’t forget to insist that your child wears safety goggles or another type of eye protection when playing athletics. This is important even if prescription eyewear is not needed. If your child does get injured in or near the eye, go immediately to the nearest hospital emergency room for assistance. 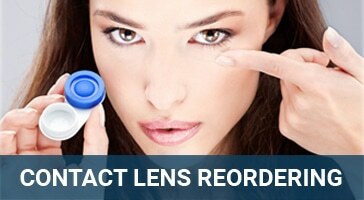 Contact lens are not necessarily only for adults. Some children can wear them also. Remember, though, that if you and your child do opt for contact lenses instead of glasses, you must take care of them. Contacts are not merely for aesthetic purposes. You must clean and wear them according to the optometrist’s instructions.